Evaluation by weight change rate of dairy herd condition. J Vet Med Sci. Mar;70(3):321-3. Effects of active egg white product / Clostridium butyricum Miyairi 588 additive on peripheral leukocyte populations in periparturient dairy cows. 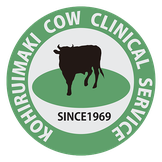 ©2018 KOHIRUIMAKI Cow Clinical Service Inc.